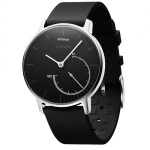 The Withings Activite Steel is essentially an upgraded version of the original Withings Activite watch. The main change is � as the name implies � a stainless steel case. It comes in a variety of colors including green, yellow, red, black, and more. There are no buttons and there is no touchscreen. Instead, the watch syncs with Android and iOS phones via Bluetooth to display information. It can track stats like calories burned, steps walked, and more.